I don’t specially mind the time involved in aging. While you’re in one waiting room or another, you can always read, listen to music, flip through magazines you normally don’t see, and — competitive to the end! — look around to check out the appearance of the other aging patients. It’s the “tests to be suffered” (to use Krystal’s language) that get to me. For all other medical staff — the nurses, technicians, medical assistants — there’s just one all-purpose word: Procedure. (“And which procedure are we having today?”) It serves for almost everything except drawing blood and the EKG, neither of which is unpleasant enough for most people to require a name that beats around the bush. Except in my case. I’m a hard stick, as phlebotomists and others who have tried to insert even a baby catheter in my veins would say. In fact, when I hear any talk at all of “blood work,” I quail. Apparently, my blood flows through vessels so small and slippery, that in professional difficulty I am tied for first place with drug addicts who shoot up until their veins are impenetrable. Which makes me a human pin cushion every time one technician after another tries to “get in” there, and there, and the next place — leaving a trail of pain and ugly bruises up and down my arms. However, even ultrasounds — “non-invasive” as they are — are sufficiently unpleasant to merit the sweet talk of being called “procedures.” Except for the one on my heart done badly in Princeton Hospital three years ago, thereby raising all kinds of alarums which turned out to be unfounded when a second one was done at Princeton Radiology after release from the hospital — mine have all been of the abdominal area. Therefore, they require no food, drink or water after midnight of the day before, which — as you may imagine — is no picnic unless the “procedure” has been scheduled for early in the morning. (It rarely is.) If you don’t believe me, see how dry your mouth gets after eleven hours without water. Besides the fasting, and being smeared with goo to ease the travels of the transmitting instrument over the front and sides of your bare body, the other not-so-easy thing about ultrasounds is the “breathe…hold your breath…breathe” instructional component of the, um, “procedure.” I have been ministered to by more than one technician who does well with the “breathe….hold your breath” part of what she’s supposed to say but then forgets to tell you when you can “breathe” again, which makes the entire experience quite challenging, especially as “breathe…hold your breath…breathe” is about 80% of it. Do you ask if you can breathe before you’re supposed to, and ruin the whole thing? Or do you near-asphyxiate yourself trying to cooperate? There are also some quite uncomfortable side positions, but I won’t complain any more about ultrasounds. There’s more coming. Those of you familiar with the colonoscopy — and its clear liquid diet and other preparatory consumptions and evacuations the day and evening before — will need no explanation when I declare that “procedure” is a term so undeservedly neutral and benign when applied to this event that it leaves me unable to continue descriptively. Because colon cancer allegedly runs in families, I have had to undergo one of these every three years since my mother died of this particular kind of cancer at 89 — her colon never “scoped” until she became dizzy from blood loss, fell, and broke her hip. My own last colonoscopy, unmentioned in this blog, was at the end of 2013. Like all its predecessors, it showed a polyp-free colon. 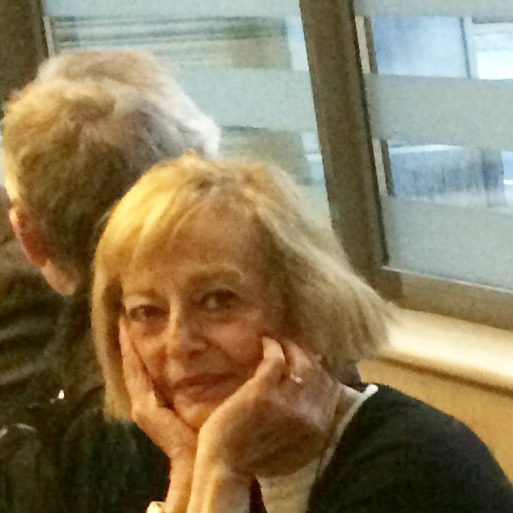 Whereupon — and much to my ambivalent surprise — my gastroenterologist then announced that now I’m 82, I won’t be needing them any more. Why not? Horrid as they were, weren’t they keeping colon cancer away? How will anyone know what’s happening inside of me? Blood work, I suppose. And now we arrive at the CAT scan. As I did, just this past Tuesday, when I had one. CAT scans are costly and also expose the patient to a heavy payload of radioactivity. As a result, they are usually not contemplated by the physician unless there’s a perceived “problem” that needs further investigation — either because of a genuine Hippocratic thirst for knowledge or proactively to protect the physician from a malpractice suit. CAT scans are therefore characterized by two difficulties for the patient not usually present in connection with the “procedures” previously discussed. The first is that unless you are truly a “que sera sera” sort of person, before you even begin to prepare for it you will be contemplating, or ineffectively pushing from your mind, all manner of worst-case scenarios. The second is that unless you are the kind of “my doctor says” birdbrain who chirps about various over-the-counter medications on television while another voice intones sotto voce warnings about possible serious side effects, including stroke, hemorrhage or death — you have to make a decision about subjecting yourself to all that radioactivity. After the only CAT scan I ever had prior to Tuesday, which showed a minuscule something-or-other at the bottom of one lung, I had a polite but strenuous argument with the pulmonary specialist who, not knowing what it was, wanted me to have another in a year, “to see” if it had grown. “But another CAT scan is 100 times more radioactivity exposure than an x-ray,” I protested. In the end, I engaged in heavy consultation with Bill, an M.D. who is against almost everything pharmaceutical or medical you don’t absolutely have to do, and also with one of his like-minded colleagues — plus a woman in a writing group I belonged to who said everyone our age had those little something-or-others and they were almost always benign. All that took nearly a year of cogitating and doing nothing, which meant I would already have been dying or dead of lung cancer if the minuscule something-or-other had been what the pulmonologist hoped it wasn’t but wanted to be sure about. So by means of procrastination and delay, I managed to not have to decide anything. The report said “small amount fluid and echogenic areas adjacent to the liver/right kidney with shadowing, consistent with calcifications is newly demonstrated. Consider abdominal CT.” Don’t ask about “echogenic” and “shadowing.” I told you this stuff is never reported in plain English. It’s the “newly demonstrated” the gastroenterologist and radiologist didn’t quite like. Bill had a long collegial chat with the radiologist. (It often helps to live with an M.D., even if he is a nearly retired psychiatrist.) It seems the newest machines are using much less radioactivity than the older ones. (Maybe the equivalent of 40 x-rays instead of 100?) And yes, the thing on the ultrasound that was newly demonstrated could just be a bit of misplaced waste, or an unclear section of the ultrasound, or entirely benign. But might not be. And wouldn’t it be better to know? Twenty years from my next birthday gets me to 103 before the results of the (reduced) radioactivity kick in. Whereas “might not be” might be real soon. And kidney cancers aren’t as bad as some other kinds. (They say.) You can do something about them. If you know they’re there. Why was I thinking this way? Because that’s what happens to monkey minds like mine when I see “consider CT.” Anyway, I bit the bullet. I scheduled the preliminary blood work. [You already know how I feel about that.] It was to make sure my kidneys were working properly. They were. Then I learned abdominal CAT scans also require intake of a noxious substance beforehand, plus an IV during the “procedure.” “What does it taste like?” I asked on Monday when I picked up the noxious substance. “Oh, it’s berry flavored,” enthused the woman at the desk, looking at the label. You can look at the label, too: It’s in the photo at the top of this post. Doesn’t it make the contents of the bottle look yummy? Do you think anything can make drinking two bottles of barium sulfate suspension yummy? No food after midnight the night before. No water after nine Tuesday morning. Drink one bottle of Berry Smoothie Readi-Cat between nine and nine-thirty. Rinse mouth if desired, but don’t swallow. Drink most of second bottle of Berry Smoothie Readi-Cat between ten and ten-thirty, bringing with you what’s left in second bottle. Get in car. Arrive at destination. Fill out copious paper work inquiring into ethnicity, preferred language, medical history, allergies, willingness to pay deductibles and copays. Be ushered into very cold back area at 11. Undress and put on utterly shapeless paper garment without ties, open at back and styled especially for hospitals and medical facilities. Shuffle into freezing white room, clutching paper garment shut behind you. Room is equipped with two female technicians plus white machine with hinged movable arm and large donut-shaped section containing hole through which you will later slide. 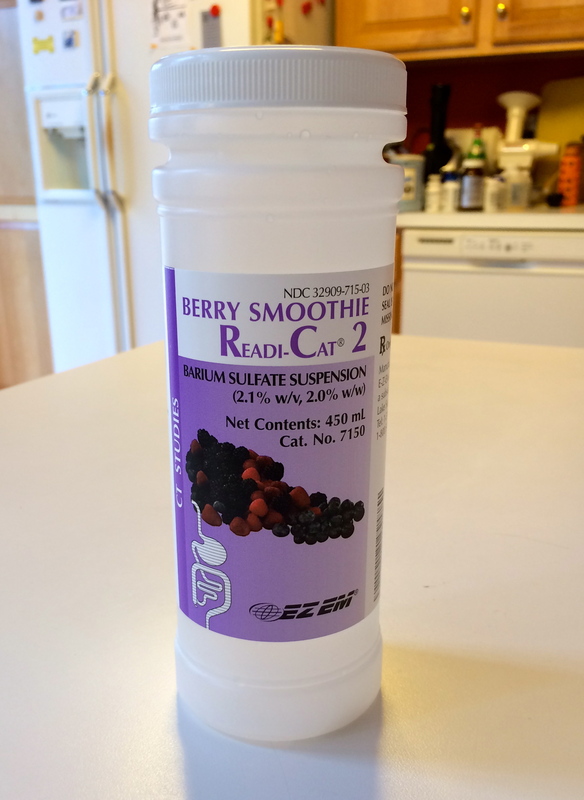 Drink remainder of barium sulfate suspension in second bottle of Berry Smoothie Readi-Cat. Lie down on table that will slide into white machine. Endure technician’s attempts to find vein in which to insert IV that will drip contrast-color dye into your bloodstream. Raise both arms above head and keep them there. Right arm can bend a little, left arm can’t. Don’t move. Don’t sneeze. Breathe and hold breath when recorded male voice tells you to do that. Breathe again when voice says “breathe.” Do that four times in twenty minutes. Every time machine rumbles, picture radioactivity washing over you. Do not move stiff achy arms. Do not scratch right cheek where edge of paper sleeve is rubbing against it and making it itch. Do not think about first serious boyfriend dying ten months ago after brief undisclosed illness. Do not think about close long-time woman friend dying of colon cancer five days after first serious boyfriend. Do not think about anyone dying. Not even you. Done? Really? Results in twenty-four hours? Doctor will call? Unlock arms and get them, with difficulty, down by your sides. Rip off shapeless paper garment, put clothes and shoes back on, go home, eat ten barbecued shrimp, ice-cream pop and fudgsicle as consolation, run to bathroom because two bottles of Berry Smoothie Readi-Cat now wish to leave your gastrointestinal tract in a hurry. Take nap with cats, order in dinner from Indian restaurant, watch Blue Jasmine with Bill. Fail to appreciate it properly, even though New Yorker critic loved it. And then it’s Wednesday morning, and Bill has another collegial chat with the radiologist, and guess what? I’m normal. The newly demonstrated echogenic area with shadowing? A bit of hardened and calcified blood that has probably been there since a small hemorrhage at birth. Just never showed up on an ultrasound before. Nothing to worry about. This is very good. There’s a Canadian writer/doctor who mined this sort of medico-poetic territory in his book Bloodletting And Miraculous Cures. Reminded me also a bit of Roth’s Anatomy Lesson. Hope your next medical visits give you both good news and more material to write about. Thanks, Mark. It goes without saying I always enjoy your comments. (They’re so flattering.) I hadn’t heard about Bloodletting and Miraculous Cures, but if I remind you even “a bit” of Philip Roth, that’s really something! As for more medical visits, I think I need a breather. Although the wishes for good news I accept, in advance. You know I can’t abide the Western medical system. (HOListiC Momma) I birthed my son at home in water. To music. Very glad you’re okay, N.